MARUBENI-OPTO™ products include non-imaging optics (anidolic optics) which includes lenses, diffusers and color filters. NIO is the area of optics concerned with the optimal transfer of light radiation between a source and a target. Hence the lenses we offer are “primary” optics. “Secondary” optics, such as diffusing elements and filters can be added and incorporated into NIO optics to avoid Fresnel-losses, or can be provided as discrete elements. 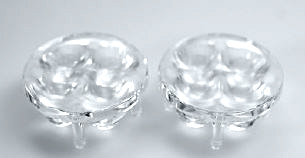 Many LEDs come with lenses that are not optimized and “waste” light. Others come with no lens, just an aperture. 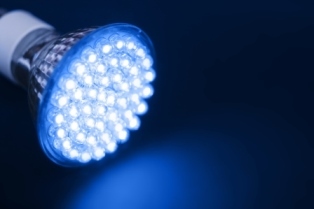 If you are involved with LED products, optical elements can play an important role in your end product. NIO optics collect light efficiently, collimate it, performing the most efficient means for radiative transfer from the LED to the desired foci. They can be molded into a variety of shapes and made with a variety of materials. Many standard products have been developed and new standard issue is created on a regular basis. In addition, MARUBENI-OPTO™ can provide custom solutions as well. This first involves ray tracing the emitter in terms light propagation and determining from you the lighting application and target. Once accomplished a CAD design can evolve and be analyzed and perfected for your approval. If prototypes are needed, advanced machining of the lens can be accomplished. Once tooled the design is then ready for production, which can ramp to your requirements. Then again if your requirement is for stand-alone diffusers, which can be used for light shaping or for dispersal from the source, or for color filters, we can serve your needs as well. Just let MARUBENI-OPTO™ know what your requirements are by making your inquiry.